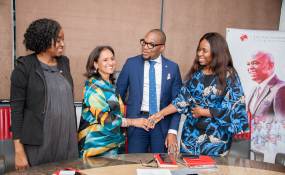 Lagos, Nigeria, 5 October 2017 – The Tony Elumelu Foundation (TEF), Africa’s largest philanthropy focused on supporting entrepreneurship, today announced that the 3rd annual TEF Entrepreneurship Forum – the most inclusive gathering of African SMEs – will take place on October 13-14 in Lagos. This is the first year the invitation-only Forum is open to non-TEF entrepreneurs and will allow SMEs from across Africa to attend and form networks, share knowledge, connect with investors, link with corporate supply chains and influence policy makers and business leaders in attendance. The two-day event features plenary panels, masterclasses, and sector specific networking opportunities as well as policy-led talks focused on improving the enabling environment for African businesses. Speakers at the event include: Wale Ayeni, International Finance Corporation; Stephen Tio Kauma, Afrexim Bank; Andre Hue, African Development Bank; Stephen M. Haykin, USAID Nigeria; Heikke Reugger, European Investment Bank; Abdoulaye Mar Dieye, United Nations Development Programme. Copyright © 2017 United Bank for Africa. All rights reserved. Distributed by AllAfrica Global Media (allAfrica.com). To contact the copyright holder directly for corrections — or for permission to republish or make other authorized use of this material, click here.